What do you do when you’re on holiday, exploring the neighborhood and it starts to rain? We had lunch. Sometimes when the hassles of life make you stop and change course just go with the flow. You never know what lies ahead. 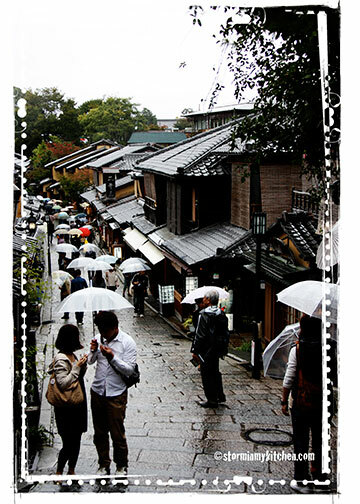 Preserved historic street of Higashiyama. It was a choice between getting drenched and an early lunch. 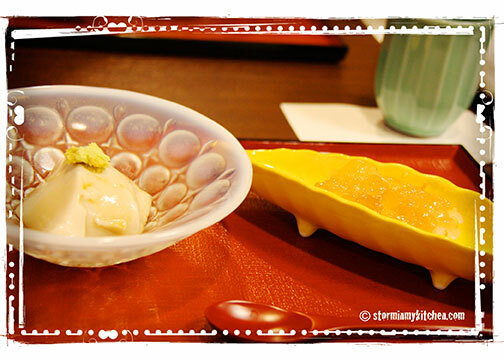 Albeit not on our list of many restaurants to try in Kyoto, it was an easy choice. We decided that looking for a restaurant on our list was not worth getting wet for. Suien will have to do. Great decision ever. The Zen-like interior has splashes of neutral subtle shades, pale wooden furniture and shoji screens. The only other customers were 2 well-dressed women seated in a quiet corner, deep in conversation. But as soon as we entered, I had a good feeling about the place. We will be fed well, I thought. We chose a table opposite the ladies, the server in a kimono, gave us the only English menu they have. It was short and sweet, a set menu. Worth ¥2,500 ($26), it comes with 2 appetizers, noodle soup, a choice of 4 main course and Japanese sweets for dessert. We’re having a kaiseki-style lunch. 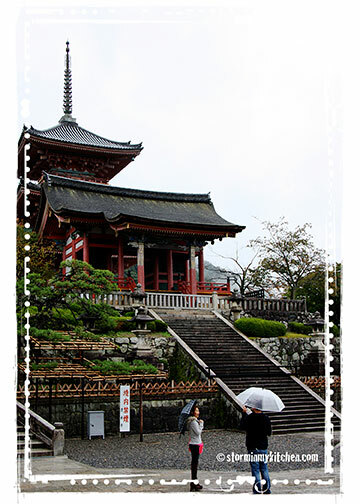 As Japan’s former capital and seat of the imperial court for over a thousand years, Kyoto is renowned for its rich culinary tradition. Diverse, its local cuisine ranges from aristocratic kaiseki ryori course to the smallest izakaya (pub). Kaiseki is Japanese haute cuisine served in carefully designed courses meant to please the emperors. Kyoto-style kaiseki puts importance on seasonal ingredients and is largely vegetarian, though fish is often served while meat never appears in a kaiseki menu. Walnut Bean Curd and Roast (adducter muscles) Scallop. A great start to a wonderful meal. The bean curd silky and smooth, sweet and salty (from the soy). Fried Sea Bream in Hot Noodle Soup. The light broth with a hint of lemon makes this rice noodle soup light and refreshing. The fish, similar to a sea bass, adds to the flavor. 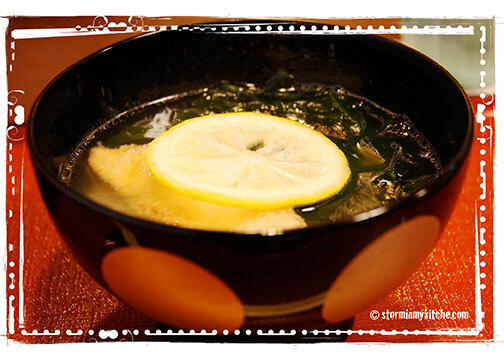 A delightful change to the usual miso soup. For the main course, I chose Donburi with Sea Bream marinated in Miso. It tastes as good as it looks. Also called Japan’s king of fish, the sea bream is very flavorful, meat firm similar to sea bass. 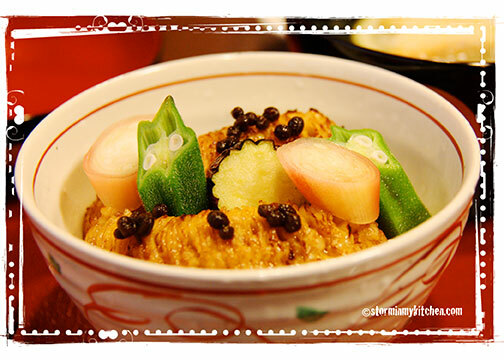 The miso delicately seasoning the fresh flavor of the fish. And finally… the dessert. Brown Sugar Rice Cake. What a way to end the meal. 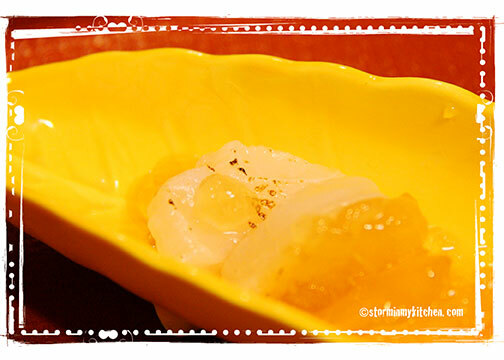 This melt in the mouth mochi is smooth and creamy, not at all starchy. Unlike any I’ve tasted. The price of a kaiseki meal can be steep but many establishments offer set menus at lunchtime at a considerably lower price. Whether lunch or dinner, it is an experience not to be missed. 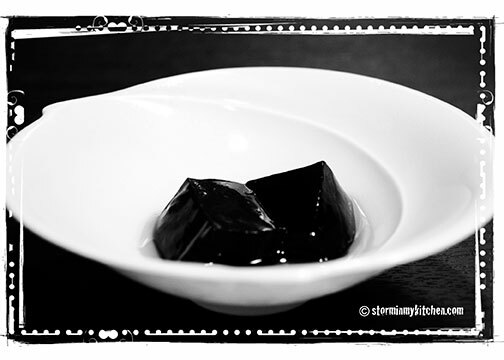 You are currently viewing the archives for February, 2013 at Storm In My Kitchen.